TUCKAHOE, N.Y. - After staving off a Democratic challenger in this year’s village election, Tuckahoe Trustees Antonio Leo and Steve Alfasi have officially been sworn back into office. Last month, Republican incumbent Trustees Leo and Alfasi easily won re-election over Anthony Fiore Jr., an auxiliary police officer and volunteer firefighter attempting to crack the all-Republican Board for the second straight year. 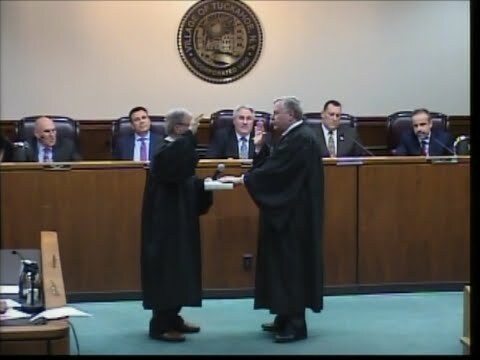 Last week, flanked by family and friends at a special ceremony, Alfasi and Leo were formally sworn in by Judge David Fuller Jr., to two-year terms that will see them offered an annual stipend of $5,075. In addition, Michael O’Toole was sworn in for a one-year term as acting Village Justice. Village appointments continued this week, with Ann Marie Ciarmella, Eric Fang and Raymond Nerenberg being named to the Village Planning Board. Barbara Nieminem was appointed as the chairperson of the Sign and Awning Board, where she will be joined by Clare Gorman and Karen Campanile.